The surface of rusty, red Mars is etched with a network of meandering formations that fork out like little Martian fingers. Timothy Goudge looks to these formations — the remains of ancient river systems that dried up long ago — for glimpses into the planet’s past. His work is influencing others to look with him. Goudge’s research on Jezero Crater — a crater, turned lake and river system, turned sedimentary rock formation — has helped make the spot one of the top contenders for NASA’s Mars Rover 2020 mission, which plans to look for signs of ancient life preserved in rock. An expert in analyzing the sedimentary evolution of planetary landscapes, Goudge started at the Jackson School in 2015 as a distinguished postdoctoral fellow. In January 2019, he’ll be joining the faculty as an assistant professor. Goudge has an intellectual curiosity that draws him to remote places on Earth and beyond. For his Mars work, the research relies on images captured by the Mars Reconnaissance Orbiter. Goudge analyzes snapshots taken by the satellite for ancient waterways and topography changes that might be linked to sediment deposition. Goudge likens the Red Planet to a large-scale laboratory, where sedimentary processes can be examined, dissected and compared to those on Earth. “Mars is a really interesting natural laboratory,” Goudge said. “It offers us a world where we know there have been the same types of forces, but some of the variables are different … like gravity. Goudge’s research so far has resulted in an impressive amount of publications and presentations for an early career scientist. He has published 23 papers in peer-reviewed scientific journals — including the prestigious Science — with 11 as first author, and has given 13 invited talks at universities, space-related government agencies and professional meetings. He also is a co-investigator for the NASA Compact Reconnaissance Imaging Spectrometer for Mars (CRISM) instrument on the Mars Reconnaissance Orbiter. “He is unquestionably a rising star with tremendous potential,” said Jackson School Dean Sharon Mosher. His research involves deconstructing the properties of outcrops on Mars by comparing them to outcrops on Earth and forces that shaped them. 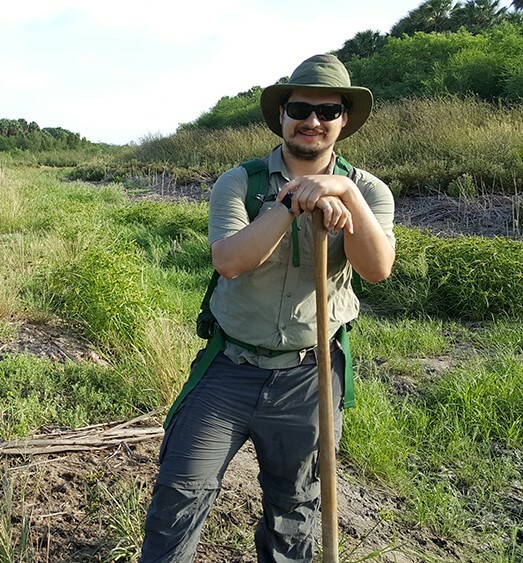 In turn, his research is helping geologists better understand the sedimentary processes at work on our planet’s landscapes and how these processes compare 33 million miles away. “That cross-talk between studying different planetary bodies is the theme I want to build in my research group,” he said. An example of his cross-planetary research in action is field work conducted with Jackson School geology professor Gary Kocurek, who retired in 2017. The team found that microbial mats in the Todlito formation of New Mexico are controlled by dune topography — a finding that potential Mars missions should keep in mind when searching the dunes of the red planet for signs of microbial life. Goudge grew up in Canada and earned a Bachelor of Science in geological engineering from Queen’s University. 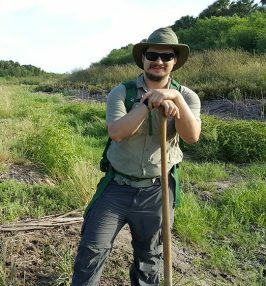 Through the help of a professor, he discovered the world(s) of planetary sedimentology, though he enjoyed spending time outdoors in the field long before that. After earning his master’s and doctorate in geological science at Brown University, Goudge was accepted to the Jackson School’s distinguished postdoctoral program. Collaborating with the Jackson School’s top-ranking sedimentology faculty, Goudge sought to learn from them more about the sedimentary processes happening on Earth. Associate Professor Wonsuck Kim, who worked with Goudge on research cutting-edge of 3-D seismic reflection technology on both Earth and Mars, said that in addition to collaborating well with faculty, he was impressed with how Goudge interacts with students. Goudge said he is looking forward to communicating with students in his research group, which he plans to be as diverse as possible. Goudge has been an advocate for not only better representation of the field, but better communication of research. In graduate school he ran a program where geology graduate students would provide hands-on science training for elementary-aged kids. In addition, he is a member of the Geoscience Empowerment Network (GEN), which promotes issues surrounding diversity across the Jackson School. Goudge said he will continue to jump at any opportunity to participate in public outreach. After all, people love Mars. “Most of what we do is funded at some level by the taxpayers, so you owe the general taxpayer your science … plus it’s just fun,” he said.